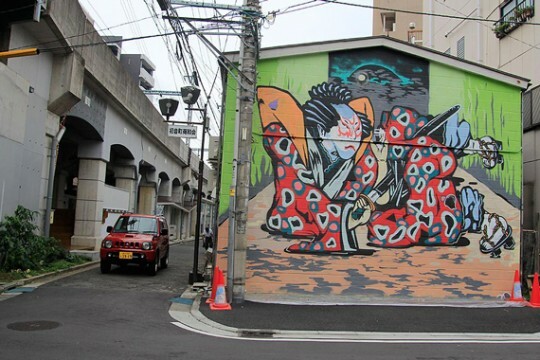 What happens when “intangible cultural heritage” meets contemporary art, when digital installations enter the urban landscape? The results are nothing short of magical. 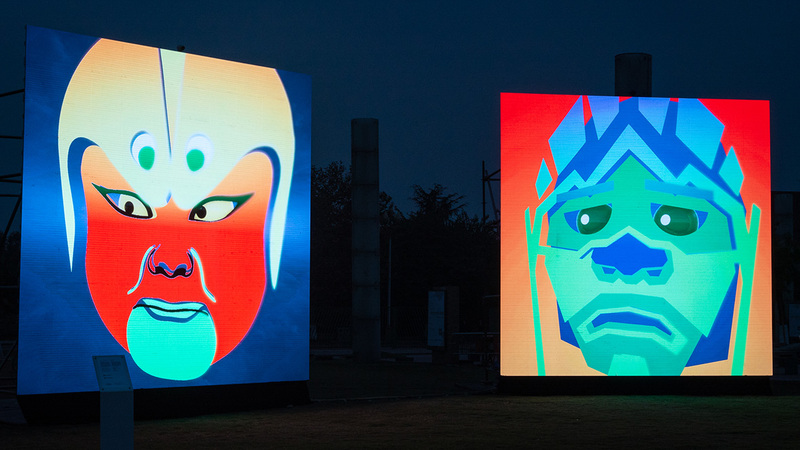 Known for its rich history, Chengdu, the “city of flowers and brocade” and capital of Sichuan province, is holding an exhibition of public art centered on cultural heritage. 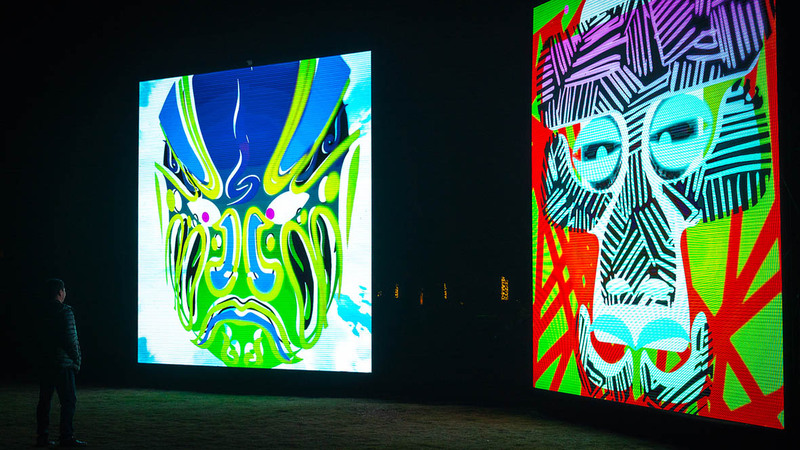 Light Up Bashu Lumen Prize featured exhibition puts paper cutting, embroidery, Chinese opera, traditional handicrafts and other aspects of “intangible” culture into contact with digital art. (“Bashu” is another name for Sichuan.) With rare ambition, the show aims to create a unique “artistic dialogue across space and time” and bring the public to the intersection of tradition and contemporary art. The exhibit will also introduce international artists to China’s heritage and bring the essence of “Bashu culture” to the world stage. We recently interviewed four of the exhibitors, along with the Guan Huijun, co-founder of the curatorial team Here Your Art, Asia exhibition manager of Lumen Art Project, to get a look at the convention-busting works that these international artists with their culturally diverse backgrounds have created. Why did you choose to showcase this aspect of China’s intangible culture? Guan Huijun: China’s cultural heritage, and Sichuan’s in particular, has a distinctive charm and a rich historical significance. In today’s rapidly developing cities, it’s a challenge to get the public, especially young people, interested in understanding, studying, and passing on traditional forms of culture, and that’s why we chose intangible heritage as our theme. Digital art, meanwhile, is emblematic of the internet age—it’s a new force that lets us keep pace with the times. We were thinking: can we use an up-to-date means of expression, something that has a certain uniqueness and memorability, to increase local connections so that everyone can better understand and participate? 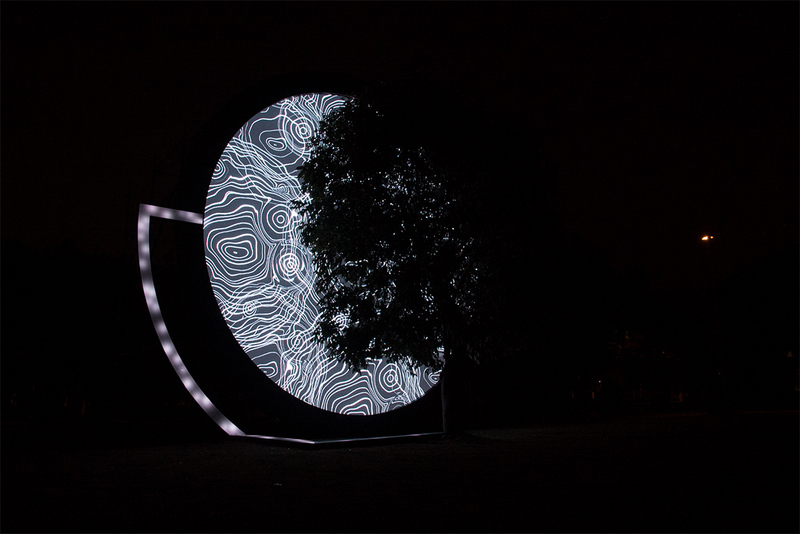 Thijs Biersteker: My piece is centered on trees. Nature has always been a very important theme in Chinese art. From Li Cheng to Fan Kuan, trees have been central. As an artist I use technology as my paint to weave together art, data and nature. Stefan Reiss & Alexander Janke: We chose to focus on kite making. The kite was invented by two of China’s great minds, the philosopher Mozi (470-391 BCE) and the engineer Lu Ban (444-507 BCE). Mozi lived a century later than Confucius and wrote about the use of kites in China during his lifetime. At first kites were mainly, though not only, used for military purposes, e.g., for measuring distances, calculating wind power and direction, and lifting fireworks or observers. Our main interest in the kite comes from the fact that it’s Chinese in origin and was a philosophical invention put to military uses. Over the centuries it spread out over the globe and was used for different activities, from sports and leisure to religion. What do you think is most interesting about your piece? Thijs Biersteker: Just as a tree creates a tree ring every year, with Voice of Nature we create a tree ring every second. 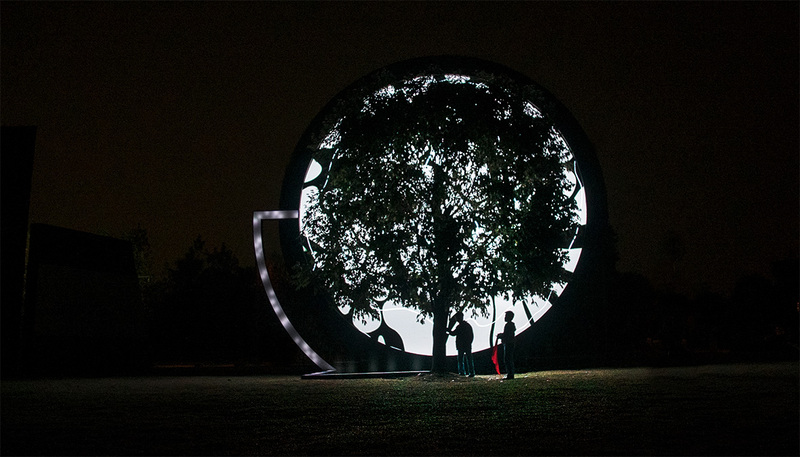 We do this using sensors and data points, showing people the tree’s state of being in real time. 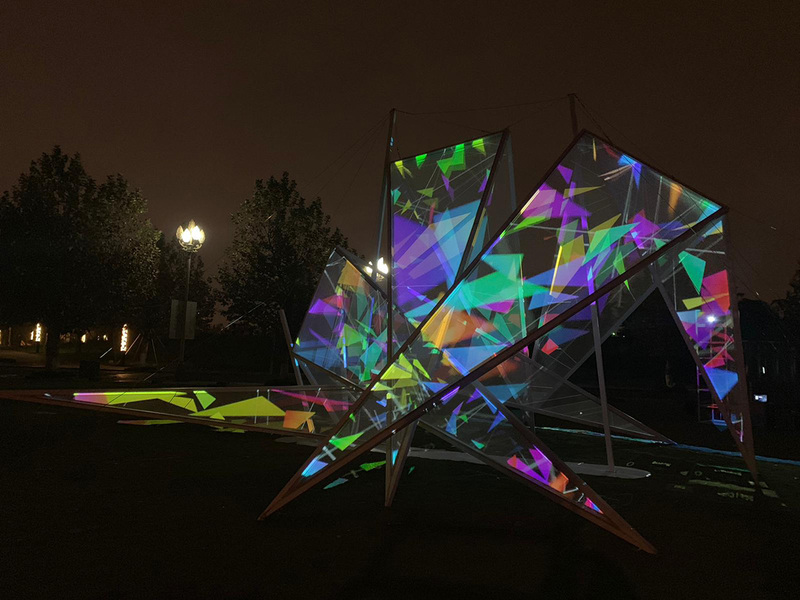 This immersive audio-visual installation is also interactive: it responds to the people surrounding and touching it, creating a connection between the art piece, people, and nature. Stefan Reiss & Alexander Janke: In our eyes, the combination of haptic materials (a sculpture with made of steel, gauze, and strings) and projection and light is very unique. 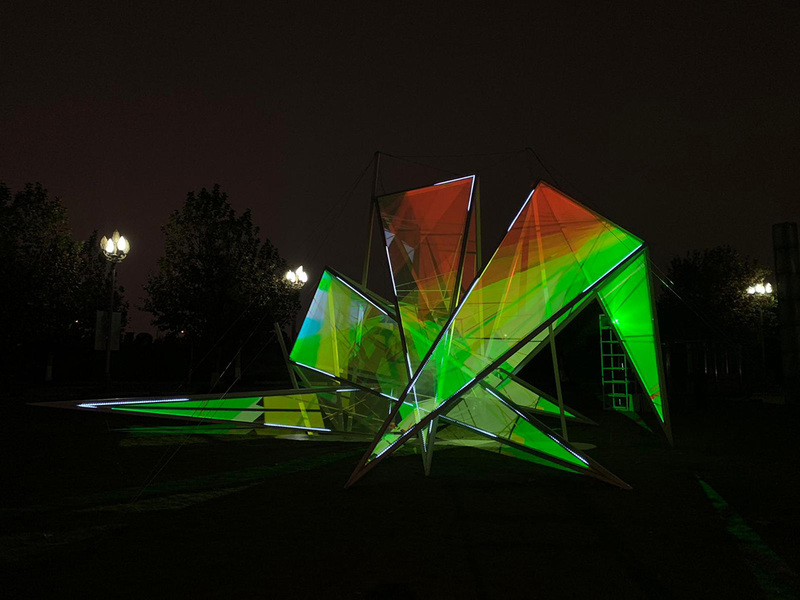 What we try to achieve is a fusion of sculptural installations—with a strong connection to the tradition of Russian, French and German constructivism and minimalism—and contemporary digital interventions with 3D and 2D programming and animations. And we even added LEDs to this advanced art piece. 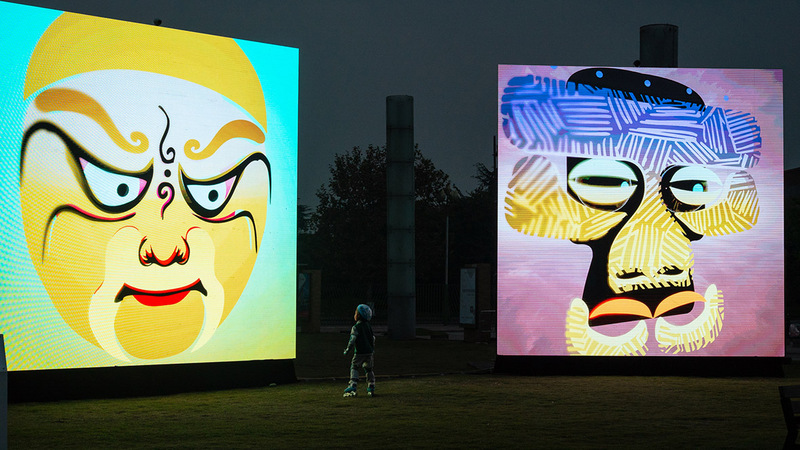 Lien-cheng Wang: My work is a moving light sculpture titled Four Scenes of Shu Dao. (Shu Dao can roughly be translated as the “dao” or “way” of Sichuan.) It has four parts. The first, “Nature,” is an image of a bamboo grove, the sun and the moon; the second sculpture, “Humanity,” showcases Chinese totemic symbols and the art of bian lian, or face-changing, an important part of Sichuan opera; the sections on “Food” and “Animals” are developed around images of hot pot, spicy peppers, and pandas. What these four images echo are the four seasons in Chinese ink painting. The theme also echoes the Daoist idea of the growth of all things. What message are you looking to convey? 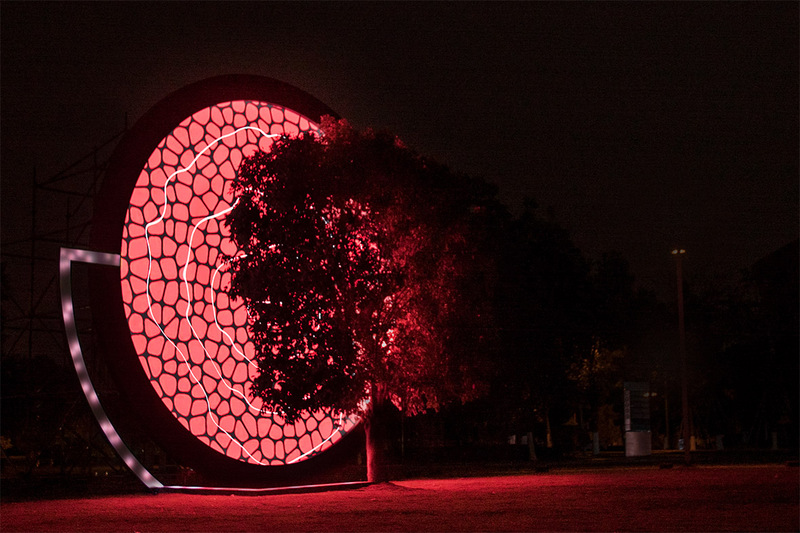 Thijs Biersteker: I hope this public artwork will re-connect people in cities to the voice of nature, putting us more in balance and interweaving us with what surrounds us and is part of us. Stefan Reiss & Alexander Janke: In the first place, we created a work that can be experienced with the whole body and all the senses. 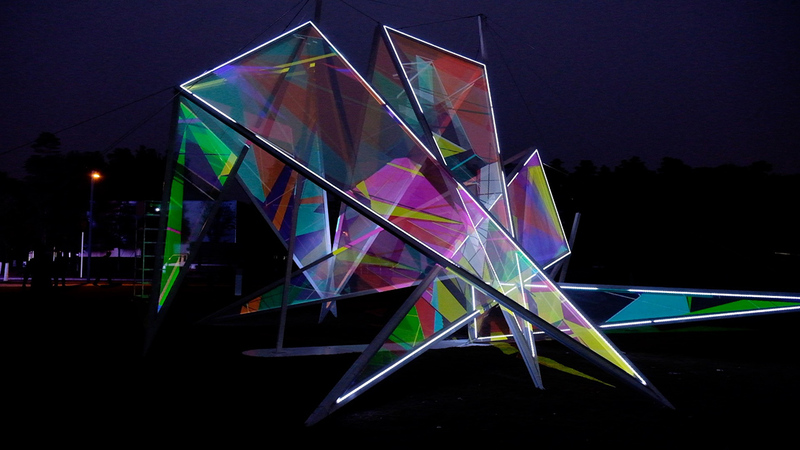 The sculpture invites everybody to step inside and feel the dimensions of the kite. Next, we provide a link from traditional Chinese kite making to our Western interpretation of the kite. We also emphasize the development of the kite from a military invention to a civil use today. Lien-cheng Wang: I want the public to see several paper-cutting styles. 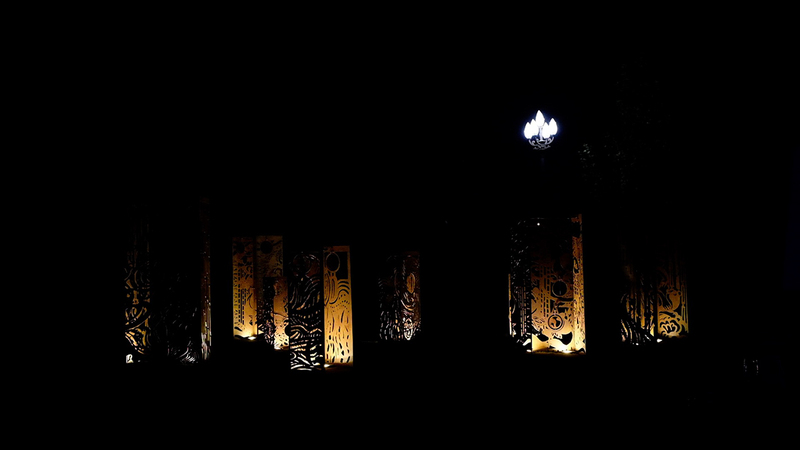 The lights, which seem to breathe, symbolize Bashu’s energy. And by wandering back and forth through the giant sculpture, the audience can experience anew the beauty of Sichuan’s intangible culture. Guan Huijun: As curator, not only do we try our best to be good “narrators,” we also help international artists “interpret” Chinese culture, grafting together Chinese and foreign creative languages. This also reflects the founding mission of Here Your Art: to create groundbreaking, innovative digital exhibits and artworks, to try to break through the boundaries of conventional exhibits, works, and audiences, and to tear down the barrier between the audience and the art. What does this show mean for you? Thijs Biersteker: I hope to work more in the Chinese market and together with Chinese artists and companies to create work that bridges the boundaries between people, nature, and innovative technologies. 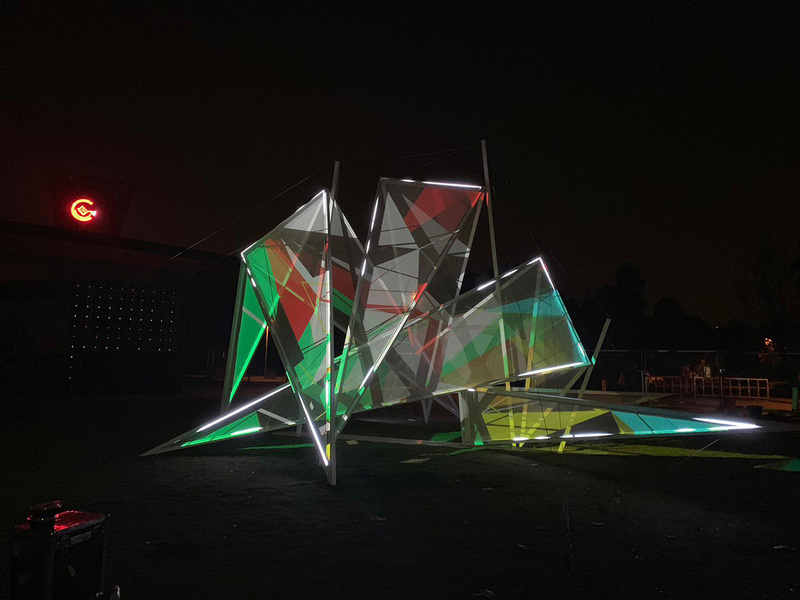 Stefan Reiss & Alexander Janke: We think that Light Up Bashu has been a great opportunity to explore new fields of art and experiment with new technologies. O.T. 981 is an artistic milestone for us because we fused art history with modern technology in Chengdu. It’s also the first time we created a piece as an artistic duo. Lien-cheng Wang: Intangible heritage is an important part of history. I think it’s the embodiment of modern culture and the legacy of the past. Tangible cultural heritage focuses more on the masterpieces of the past, and what I’m more interested in here are the early stages of a project. I’ve used several images of intangible culture to develop the art visually, and added modern technology. 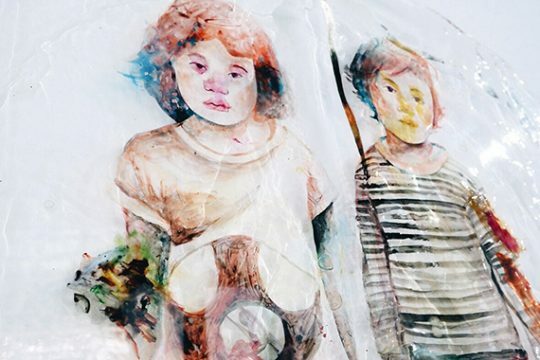 Guan Huijun: What does this show mean to us? Our previous answers have made this clear. On a more concrete level, when residents wander over at dusk to see the works, the light in their eyes and the smiles on their faces mean a tremendous amount to us. Four short questions on new topics, new media, new work. 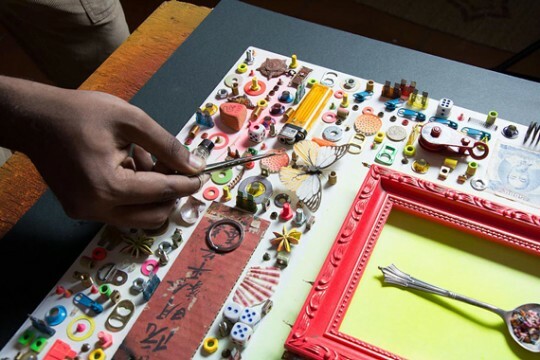 Artists and curatorial teams may have different interpretations, but these artworks spanning media and fields all explore, in broad strokes or with minute precision, the interactive relationship between contemporary art and traditional culture. Light Up Bashu Lumen Prize featured exhibition will run until December 3rd at Chengdu’s International Intangible Culture Heritage Park.